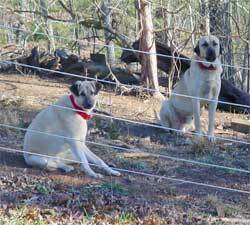 We are proud of our AKC registered Anatolian Shepherd livestock guardian dogs. We got Diesel out of Oklahoma in July when it was around 100 degrees here in South Carolina. I went out to find him the first morning and could not find him anywhere, then I looked over in a water trough and there he was cooling off. Turk, the patriarch of our shepherds. Four years old at the time of this picture. 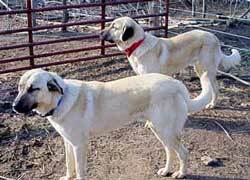 We have purchased a new Female AKC Anatolian named Sandy (left, above), she is 14 months old. We have paired her up with Kujo (right) and are expecting a litter this spring. 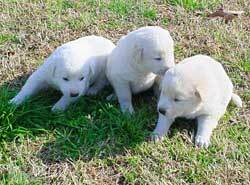 Please let us know if you would like to be on our waiting list for this litter. The Anatolian Shepherd Dog is one of the most majestic and noble animals in the service of man; still being used in the rural districts of Turkey as the shepherd's indispensable companion and front line of defense of his livestock from predators. Since the Turk is prohibited from owning a rifle, the proven dog becomes his twenty-four-hour security system. To detect enemies, keen hearing, smell and sight are basic requirements. Without the aid of the Anatolian Shepherd Dog, the Turkish Shepherd would be less able to defend his property and flock from wild animals. The extraordinary speed and agility of the Anatolian Shepherd Dog enables him to run down a predator with great efficiency. Historically, since Babylonian times, there is documented a breed of large, strong dogs with a heavy head. With the advent of the first domestic sheep, the dogs went from "hunter" to "protector". The book of Job, which dates back to at least 1,800 BC and is set in the region of Turkey, makes reference to the dogs with the flocks. The Anatolian Shepherd Dog of today has remained relatively unchanged from it's ancestors because of the nature of it's isolated existence. In 1968, Lt. R. C. Ballard, USN, was sent to Turkey where he settled his family in the city of Ankara. Friends told him that a dog would be the best deterrent against thieves. Turkish acquaintances suggested buying a pup from a locally famous guard breed called the Anatolian Shepherd. From farmers of an ancient village, which had been in existence since the days of Alexander the Great, they purchased a six week old male puppy. The puppy was the whelp of semi wild parents, who lived alone for months at a time in the rugged country surrounding the village, with only the sheep they were protecting as comrades. The Ballards named the pup Zorba. The Ballards also purchased a second Anatolian, a female puppy named Peki. Thus the Anatolian's entrance into the United States began. In 1970 Zorba and Peki were parents. At Red Creek Farm we have 7 adult Anatolian Shepherds that guard our Full Blooded Boer goats including our new born babies. They are the most loyal, gentle and protective dogs that I have ever had the privilege of living with. Geromino (blue collar) and Kujo (red collar) are Turk's sons, and are 15 months old in this picture. 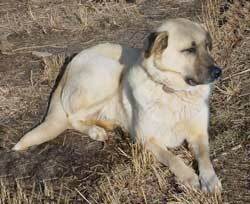 Shelly is presently the only female AKC Anatolian Shepherd on our farm. We are looking for another AKC female with bloodlines that will compliment our males. 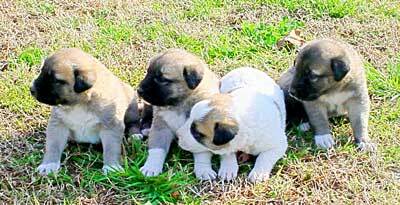 Click here for Anatolian Shepherds For Sale.